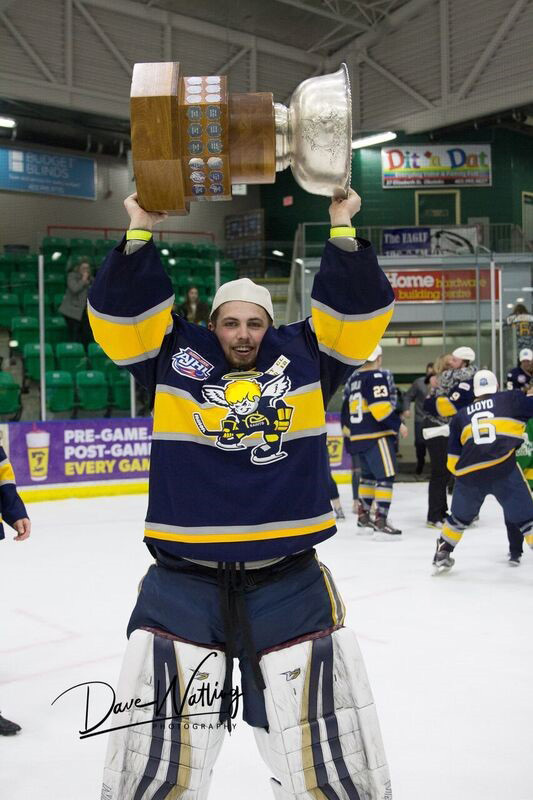 After the season Nolan Kent has had, winning the AJHL championship is a bit surreal for the Chestermere goalie. Kent backstopped the Spruce Grove Saints to a 4-1 series victory over the favoured Okotoks Oilers, with the clincher in Game 5 a 3-2 nailbiter last Friday in Okotoks. 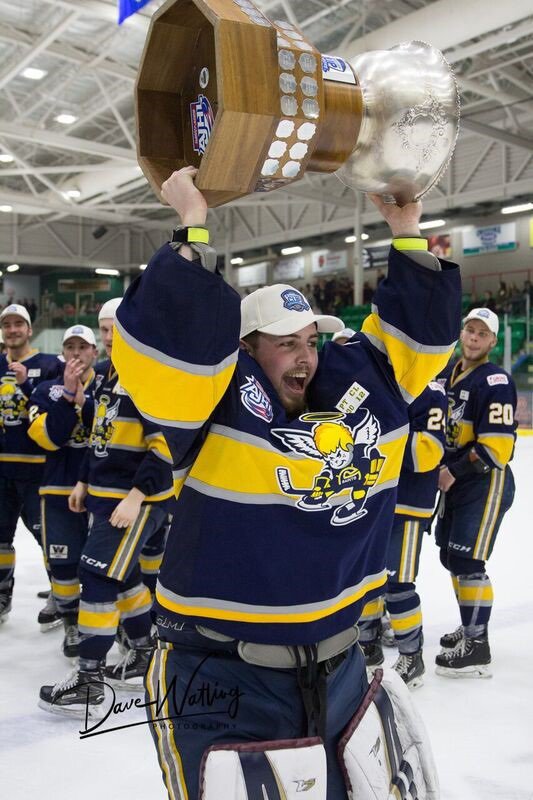 The Saints spent the weekend celebrating but the victory took a while to sink in for Kent, who went 12-1 with a 1.58 goals-against average and .923 save percentage in the AJHL playoffs. “It’s nothing I’ve ever experienced before,” Kent said. “The only other championship I’ve won is a midget double-A championship out in Strathmore a few years ago. “We have two more chances to win trophies. It’s pretty cool that way. Kent’s season went up and down. He suffered a knee injury in late October that required surgery, but he was able to return from that torn meniscus in February. When the playoffs hit, the Saints caught fire, sweeping two best-of-seven series en route to the AJHL final against the Oilers. The Saints jumped out to an early lead in that series with two overtime wins in Okotoks, then took Game 3 by a 3-1 score in what Kent feels was their best effort of the playoffs. They dropped Game 4 by a 4-1 score, but it was a good sign they rebounded with a great effort in Game 5 to clinch it. The entire series was close, which makes the 4-1 victory seem like a misnomer. “I feel like we handle pressure situations very well,” Kent said. “We don’t get too high, what we call a blue head. Our group is built to play tight games like that and that’s what you should expect when you get into this part of the season. It’s tight checking and not a lot of scoring chances. Really good hockey. The Saints now face the BCHL-champion Wenatchee Wild, which captured that title in just their third year in the league. The Wild are known for their wide-open offensive style, which is typical of the BCHL. Kent expects the seven-game series to test him and his team, which will be playing on a larger ice surface when the series opens in Wenatchee, Wash.
Kent and the Saints don’t know much about the Wild, other than they have just two Canadians on the roster, which leaves them a bit of a mystery. “There is a lot of video but we won’t know exactly what we’re facing until we get out there,” Kent said. “It’s a seven-game series so I’m sure the first game will be a feeling out process.